Radiate splendour with this stunning Moments Signature clasp bracelet by PANDORA, featuring a cubic zirconia encrusted pavé barrel clasp. Buy online or in store. 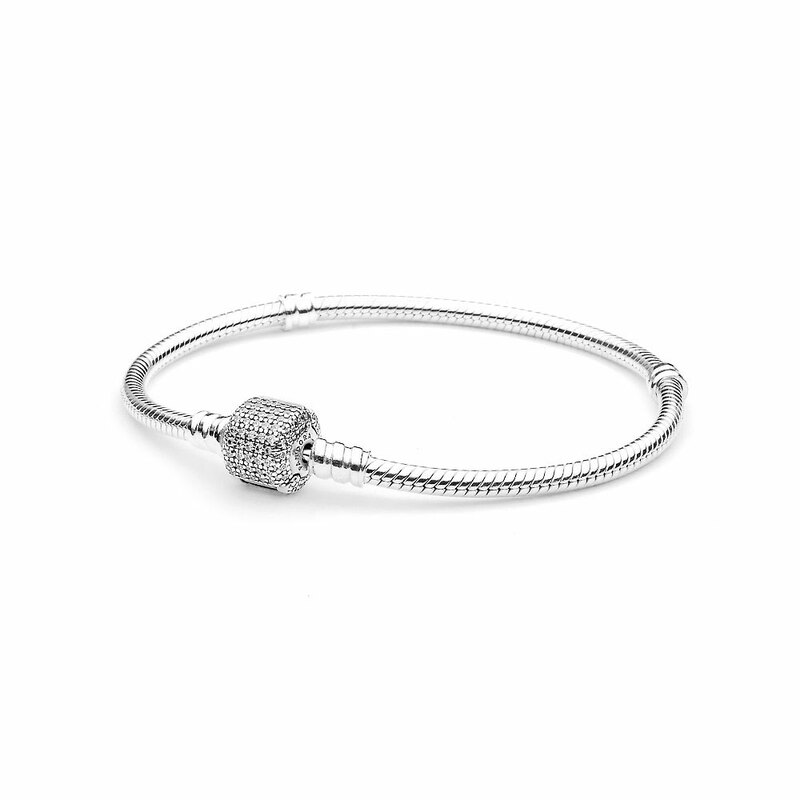 PANDORA Moments Pavé Silver Bracelet is rated 4.3 out of 5 by 72. Rated 5 out of 5 by SuzyinAL from So Pretty! I bought this Pandora bracelet because my wrist is small and I could get it in a small size. I chose this particular one because I really liked the clasp. It is a little "dressier" than the signature clasp. It is simple and elegant. Just remember, it IS silver, and tarnishes quickly. You must have a polishing cloth, and should be stored in an anti-tarnish bag. Rated 5 out of 5 by amntempest from Perfect wedding gift from my husband My husband gave me this bracelet on our wedding day with a "Just Married" charm and it is one of my most cherished possessions. Everywhere we travel to we get a charm to add to my bracelet. It serves as a beautiful journal for us to remember all of the significant events in our lives. Rated 5 out of 5 by Katidog14 from STUNNING! Clasp is beautiful on this bracelet. For the person who loves the sparkle effect I would highly recommend it. I love the look with my pave charms and the clasp looks like one of the charms. Rated 2 out of 5 by Angie23 from Not happy with this gift I'm late with this review but I received this as a birthday gift from my god mother and the clasp kept coming loose. The bracelet eventually fell off my arm and i didn't notice until it was too late. What a waste of a bracelet and two charms. Rated 5 out of 5 by Aly M from Dazzling! Everywhere I go someone has something to say about the sparkle. I'm in love!